With the UN Climate change conference currently under way in Copenhagen Denmark, it's not at all surprising that a member of the Danish royal family would make an appearance at some of the events. Of course it wouldn't do to show up at such a conference in a Rolls-Royce or Bentley. However, a Prius would be a bit too pedestrian. How about something with some flash and lower emissions than the iconic Toyota? Throw in a Danish connection and you've got a deal. Thus, Crown Prince Frederik will arrive at two of Tuesday's events at the wheel (yes, the wheel) of the Fisker Karma. Designer and Fisker Automotive CEO Henrik Fisker is Danish by birth and the plug-in serial hybrid (or ER-EV if you prefer) is expected to score about 83 g/km in CO2 emissions. The prince becomes the first non-Fisker staffer to be allowed to drive the high performance, low emissions sedan. We now expect the Karma to hit the streets in the second half of next year. The Karma has been making the rounds in Denmark, as we can see in these pictures. Danish crown prince to drive Fisker Karma prototype to climate conference originally appeared on Autoblog Green on Mon, 14 Dec 2009 16:56:00 EST. Please see our terms for use of feeds. 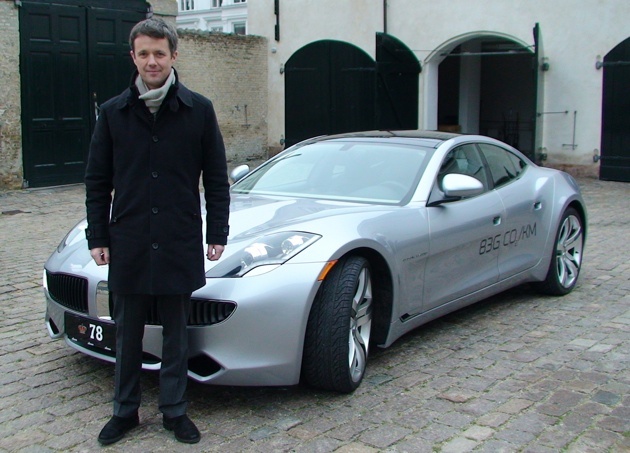 0 comments on "Danish crown prince to drive Fisker Karma prototype to climate conference"